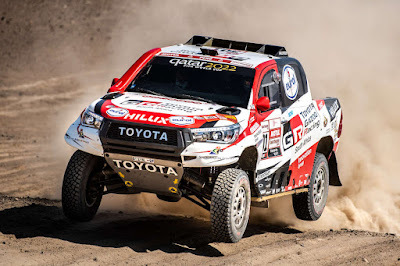 Toyota Hilux has triumphed with a milestone first victory in the world’s most grueling rally, Dakar. Champion driver Nasser Al Attiyah and co-driver Mathieu Baumel cruised to the finish line with a 46-minute cushion after the 3,000-km marathon dominated by Peru’s tricky and often treacherous sand dunes. “We are so happy to win the Dakar - not only for ourselves, but also for Toyota and the entire Toyota Gazoo Racing SA team,” Al Attiyah said. The Toyota Hilux Dakar may look like the production pickup truck that carries its name, but is actually a special-built racer. It features independent suspension all around, a mid-mounted normally-aspirated V8 engine, and all-wheel drive. The 2018 rally car is a heavily-revised of Toyota’s 2017 entry and thus enabled the team to concentrate on giving it added durability and reliability. Among the changes done this year included a revised rear suspension with 12 percent more travel and less weight. The engine and gearbox were largely carried over from the year before. The victory means that Toyota GAZOO Racing has now won both of the world’s toughest automotive races - the 24 Hours of Le Mans and the Dakar Rally.